I had the privilege of representing the MVCC on a 3 day tour of the Los Angeles Aqueduct System, as a guest of the Los Angeles Department of Water & Power. It was an amazing tour – eye opening and thought provoking. Having already read about our water history in Cadillac Desert and with memories of the film classic China Town, I was eager to get a first hand view for myself. Water conservation is a passion for me. I know that we have less than we need – but this trip gave me dramatic evidence of just how little we have. Even more important, I saw first hand the damage we did taking the water we have enjoyed since we built the Los Angeles Aqueducts – and just how difficult it has been to undo the damage. 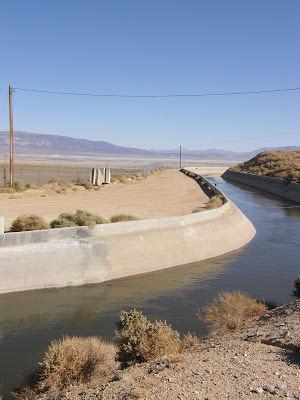 When Los Angeles filed for water rights from the Owens Valley River, we took 100%. Until recently, that provided us with 75% of the water the DWP uses for Los Angeles. It is cheap water - $170 to $200 per acre foot, compared to the $600 to $800 per acre foot that we get from Colorado through the Metropolitan Water District. It tastes great – Crystal Geyser actually pulls their water from the same source. But the cost was too high. By diverting the Owens Valley River water to the aqueducts, we dried out the 110 mile Owens Lake, creating unbearable alkaline dust storms that made the area almost uninhabitable. The Clean Air Act mandated that we mitigate the damage. Since the 1980’s, we have spent $4 million a year studying the problem, $450 million in implementation and $30 million a year to manage the mitigation. Today we have stopped the dust and re-watered the river, but the lake remains dry. Instead of supplying 75% of our needs, we have had to reduce the amount we take to only 35% of our needs. Los Angeles has done a good job of reducing our interior water usage - our water consumption today is the same as it was 25 years ago, despite a million more people. But our per capita daily use is still 144 gallons per day. Compare that to Europe, where it is 69 gallons. The primary difference is water use for outdoor landscaping. This trip showed me the impact on a small region. It has taken 40+ years to mitigate the damage in the Owens Valley. If we don’t change our thirsty habits, what damage will we do globally? What will life be like for our children 40 years from now if we don’t change course now? Like many in Mar Vista, our family tore out our lawns and replaced them with drought resistant landscaping. As a result, our per person water usage is 69 gallons per day. This is less then half of the Los Angeles average and comparable to the average usage in Europe. We can do this. Let’s not wait too long to start.